At one point, Alex Irvine looked like he was popping the question to one of Biltmore’s oldest residents. Earlier this week, Alex, a ceramic artist based in Asheville, didn’t have matrimony in mind. Rather, his down-on-one-knee position at the side of Flora, a 120-year-old statue on the South Terrace of Biltmore House, was more like a healing gesture. 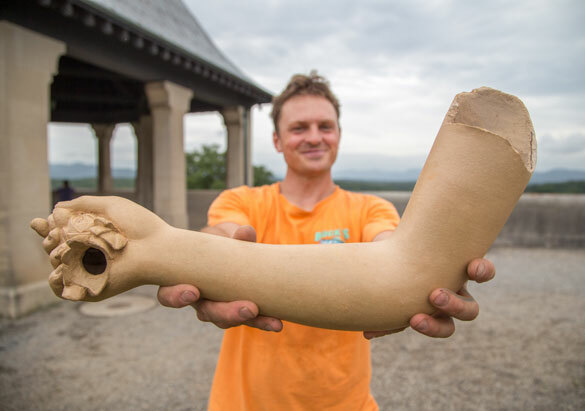 Alex has been working with Kara Warren, Preventive Conservation Specialist in the Museum Services department, to re-create an arm that Flora lost decades ago. The original is no longer in Biltmore’s possession. Originally repaired in 2003 using a non-ceramic material, the resulting fix was challenging to maintain and eventually weathered. For the new repair, Alex re-created the arm in his home studio using a fired ceramic material which is expected to stand the test of time. In addition to the missing arm, he has recreated a few missing fingers and a garland that the sculpture held in her hands. Flora is the Roman goddess of spring who signifies blooming flowers and renewal. The ceramic sculpture is copied after the French artist Antoine Coyzevox’s sculpture Flore (“Flora”). It was offered in a catalog dating back to 1886, along with three other sculptures installed on the South Terrace around 1900. In addition to the re-creation and attachment of the missing elements, an internal structure was fabricated to support the arm and garland. Stabilization of the overall surface of the sculpture will also take place. This is a great example of the work we do to preserve the estate for generations to come. An added plus in this case is the chance to collaborate with the local arts community. Work on the statue will conclude soon. To see the newly-repaired statue of Flora and all her companions on the South Terrace, plan your Biltmore visit today.